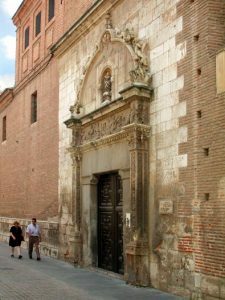 The Convent of the Image is the most representative of the Renaissance convents of Alcalá de Henares. It was founded in 1563 by the Blessed Sister María de Jesús in collaboration with Santa Teresa de Jesús and under the patronage of Dona León de Mascareñas, aya of Felipe II. The first convent was located in some houses of the Plaza de la Victoria and in 1575, the congregation moved to the current building, former palace of the Marquis of Lanzarote. At that time, the palace belonged to a certain Juan de Arenillas, who lost it in a game of cards, and became property of Luisa de Muñatones, who sold it to the nuns. The Plateresque facade is attributed to Alonso de Covarrubias, who at that time was working in the Archbishop’s Palace. It is decorated with fantastic figures, grotesque and dragons and culminates in a niche with the image of the Immaculate under which is the shield of the Carmelite order, replacing that of the Marquis of Lanzarote. This convent was visited on several occasions by Saint Teresa of Jesus and had as prioress Luisa de Cervantes, sister of the writer, on three occasions.